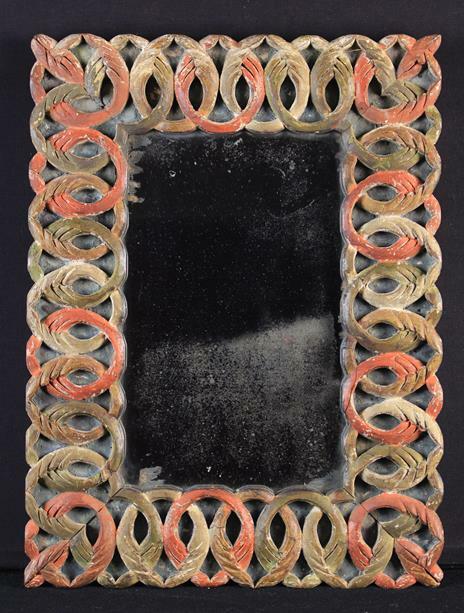 A 19th Century Wall Mirror. The rectangular glass in a carved & painted frame of interlinked foliate rings, 21 ins x 16 ins (53 cm x 40 cm). An Unusual 19th Century Carved & Polychromed Wooden Shop Mannequin with glass inset eyes and articulated arms, standing on a plinth base 44 in (112 cm) in height. 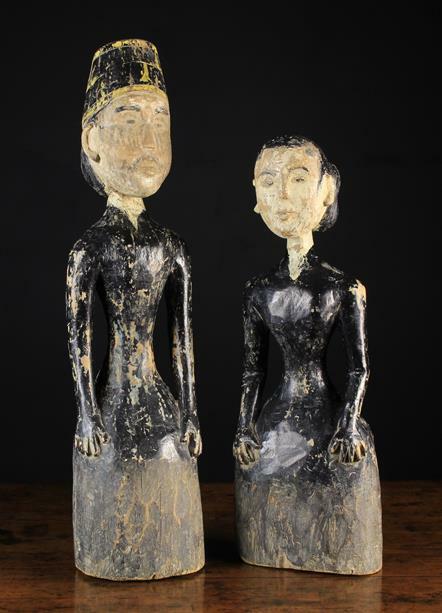 An Unusual Pair of Whimsical, 19th Century Polychromed Wood Carvings of an Eastern Man & Woman, possibly Nepalese. The figures naively carved with hour-glass waisted bodies above truncated shirt bases; both wearing a long black robe; the lady with her hair in a twin bun to the nape of her neck 20¾ in (53 cm) in height, the man wearing a fez style hat 25½ in (65 cm) in height. 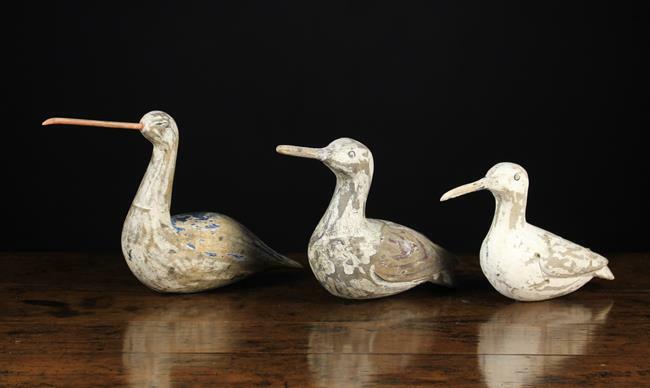 Three 20th Century Naively Carved & Painted Wooden Ornamental 'Decoy' Birds with long bills, approx, 15 in 38 cm), 13 in (33 cm) and 12 in (30.5 cm) in length. A Small 19th century horn powder flask with scoop, incised and nail punched with a wagon initials F.P. flanked by decorative bands, 5¾ ins (14.5 cm) in length. A papier-mâché travelling pen & ink case 7½ in (19 cm) in length, a horn trinket box mounted with six paste gems to the lid, possibly Scottish. A small 19th century ink & watercolour satirical cartoon inscribed 'Of a difficulty in choice' in an ebonised reeded frame 5 in x 4 in (13 cm x 10 cm). 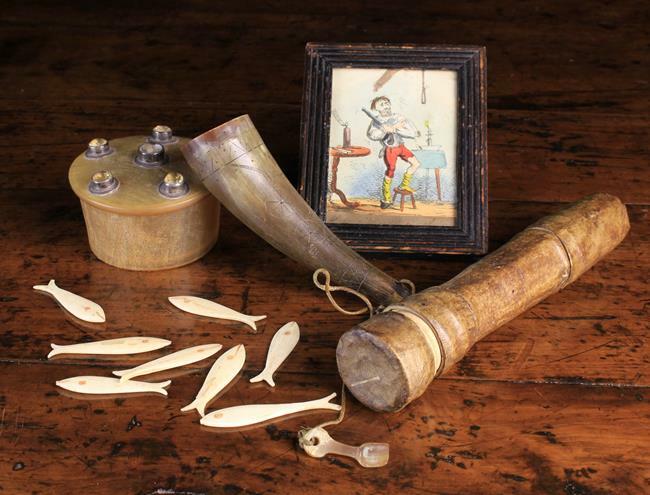 And eight 19th century fish shaped bone gaming counters. 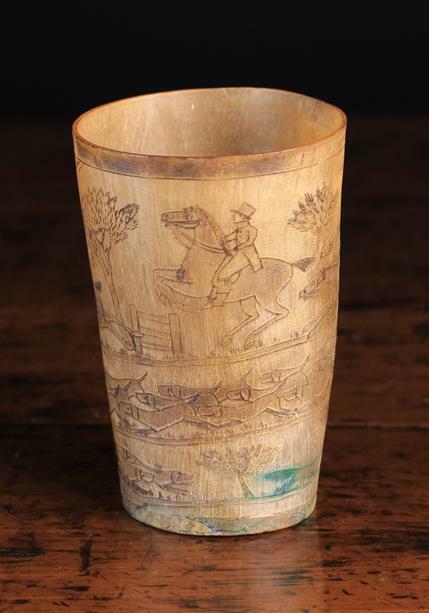 An Early 19th Century Horn Beaker engraved with a hunting scene spiralling around the sides, 4½ ins (11.5 cm) high. 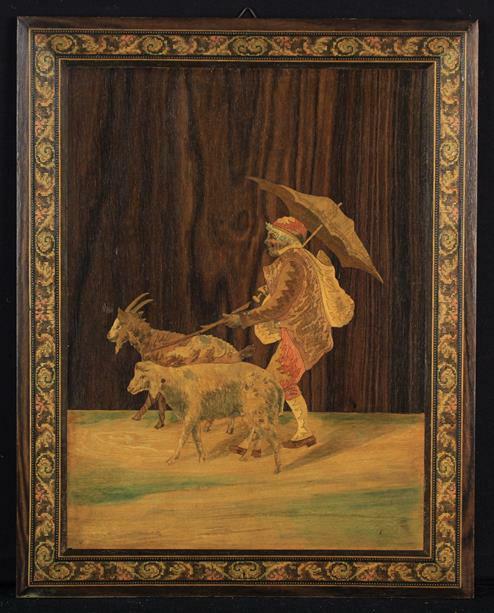 A Fine 19th Century Marquetry Panel depicting a man with umbrella herding a goat and sheep enhanced with coloured stains and defined against a rosewood background, framed with a decorative micro-mosaic border, 15 in x 12 in (38 cm x 30.5 cm). 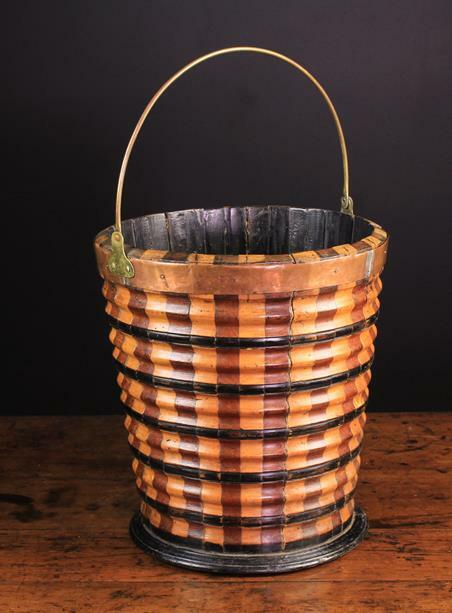 A 19th Century Cooper Peat Bucket composed of ripple moulded staves of contrasting coloured timbers ringed with bands of ebonised moulding, with a copper rim band and brass swing handle, 13 in (33 cm) high, 12 in (31 cm) in diameter. 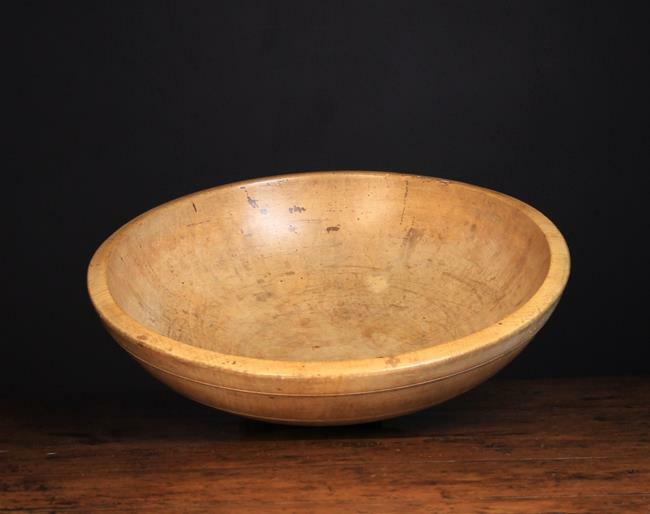 A Large & Fine 19th Century Sycamore Dairy Bowl with decorative turning to the exterior on a slightly raised foot. 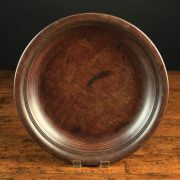 Good colour & patination 6¼ in (15 cm) high, 20¼ in (51 cm) in diameter. An Unusual Treen Bowl of turned exotic hardwood, with shallow outswept sides and a footed base, 12 in (30.5 cm ) in diameter, in the form of a Chinese porcelain dish.